I guess this is not the most exciting skill or thought to have when one wakes up in the morning, however, it is the one on my mind, and my morning thought is always ‘what has woken my mind today’. Following a late night conversation with a friend who is a producer of products my mind was working over night on the differing ways that TBC Friends earn their living. Which ever way it is, if you have suppliers, whether a service provider or a product, making sure you get your money in before you have to send it out is critical to survival. Financial knowledge is often a skill that new business owners learn though pain not pleasure. Working on spreadsheets, managing the bank account, delegating receipts to a bookkeeper, panicking when the tax man gives the proverbial knock on our door for cash we haven’t allocated and provisions for. These are all pain points and often the aspect of being in business that we push aside to a Sunday, or the last few days of the tax year. 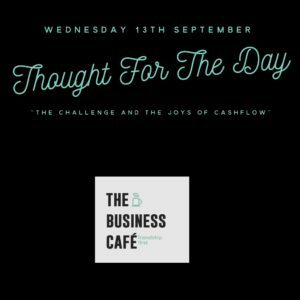 But cashflow is the lifeblood of any business, in fact without its knowledge we could be trading insolvent, and that is illegal. But what about the huge need for cash when you are a product business, when you need to stock, manufacture and turn your investment into cash so you can buy the next production line of goods. This must take a lot of management. I guess the benefit of service delivering is we don’t have as much strain on our cash, however we can only scale when we increase our capacity, invest in people, systems or licensing our knowledge and IP, to have the capacity to bill more hours than we have been given in a day. Products can scale through distribution, retail and online. The pros and cons of our choices I guess. A lot of rambling, and I guess my thought today is about managing our money in a way that allows us to scale and grow and also have peace of mind around our flow of cash. I would love to hear from you about your journey to financial awareness, and if any of you have a product based business, I would also love to know more about you, Christmas is coming up (sorry) maybe TBC Friends can buy our presents from our TBC Friends this year. If you are a product provider, start your own thread and see if we can help you to grow, but please also share some of the challenges as that helps us to help you too.